Brambleton, named for a plantation that once occupied the area, has become the fastest growing community in LoCo. Situated on 2500 acres on the south portion of Ashburn, the plan is to eventually have more than 8,000 residences, including single family homes, townhomes, and condos. Construction is still ongoing, with homes constructed by Knutson, Miller & Smith, Pulte, Toll Brothers, Van Metre, and Winchester Homes. The heart of Brambleton is the Town Center, with entertainment, restaurants, retail and public spaces. Serving as the location for concerts, events, a weekly farmers market, and various festivals throughout the year, residents can always find something to do here. 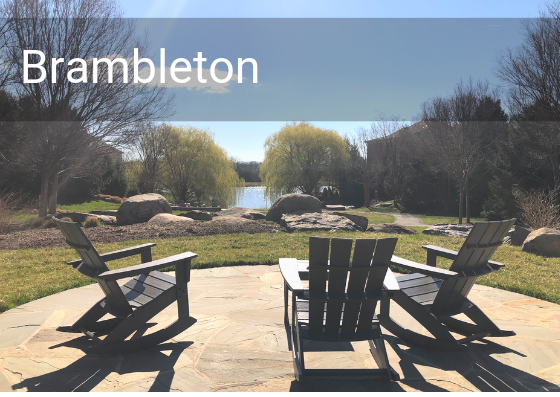 We recommend following the Brambleton Facebook page to stay up to date with all of the community events. There are numerous amenities located throughout the neighborhood including a community center, two outdoor pools with two in the works, a sport and health club, nine parks, sports fields and courts, ponds, and miles of trails. Also nearby is Brambleton Golf Course, operated by the Loudoun County Parks and Recreation Service. Homeowners automatically have Verizon’s FIOS (internet, basic cable, and basic phone) service as part of your Association dues and students currently attend Legacy Elementary, Creighton’s Corner Elementary, Madison’s Trust Elementary, Stone Hill Middle, Brambleton Middle, Rock Ridge High and Briar Woods High schools. Independence High School will open in the community in the fall of 2019.